With George Bernard Shaw’s classic play Saint Joan onstage at the Folger this month, we published Folger Theatre’s playbill essay about Shaw’s acerbic criticism of Shakespeare. This brought us back to a 1994 exhibition at the Folger called Roasting the Swan of Avon: Shakespeare’s Redoubtable Enemies and Dubious Friends. The following text is excerpted from the catalogue for that exhibition, Roasting the Swan of Avon by Bruce R. Smith. 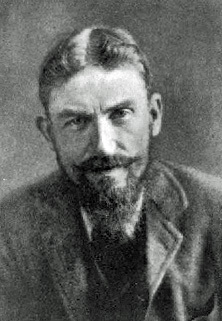 For the word “Bardolatry” we can thank George Bernard Shaw (1856–1950). After years of sparring with Shakespeare in his reviews of the London stage, Shaw in the Preface to Three Plays for Puritans (1906) finally hit upon just the right term for the public’s uncritical enthusiasm for Shakespeare—an enthusiasm inspired, in Shaw’s view, not by direct knowledge of the plays but by the “spurious and silly” productions that had held the stage from the 18th century until Shaw’s own time. There are moments when one asks despairingly why our stage should ever have been cursed with this “immortal” pilferer of other men’s stories and ideas, with his monstrous rhetorical fustian, his unbearable platitudes, his pretentious reduction of the subtlest problems of life to commonplaces against which a Polytechnic debating club would revolt, his incredible unsuggestiveness, his sententious combination of ready reflection with complete intellectual sterility, and his consequent incapacity for getting out of the depth of even the most ignorant audience, except when he solemnly says something so transcendently platitudinous that his more humble-minded hearers cannot bring themselves to believe that so great a man really meant to talk like their grandmothers. With the single exception of Homer, there is no eminent writer, not even Sir Walter Scott, whom I can despise so entirely as I despise Shakespeare when I measure my mind against his. The occasion for this particular exercise in “Blaming the Bard” was a review of a production of Cymbeline (“for the most part stagey trash of the lowest melodramatic order”) reprinted in Shaw’s collected Dramatic Opinions and Essays (1907). Burbage’s power and popularity as an actor enabled Shakespear to free himself from the tyranny of the box office, and to express himself more freely in plays consisting largely of monologue to be spoken by a great actor from whom the public would stand a good deal. That is to say, Shakespeare’s best plays are just like the ones Shaw himself wrote. All rights reserved. Copyright © 1994 by the Folger Shakespeare Library.